Want to improve the air quality inside your home? Consider an air purification, air cleaner, humidifier, or dehumidifier system so you can breath easier. Pollutants, dust, dampness, and other common indoor air quality problems often trigger allergy, asthma, and other serious attacks. Children are especially vulnerable to such attacks. Let Argent help you pick the best air purification and comfort system for your home. Argent technicians even have the know-how and skill to install the latest green steam purification systems. To learn more about air cleaners, filtration systems, and purifiers, speak with an Argent representative today at 908-286-1920. When it comes to deciding upon the most effective air cleaning system for your home, you have a lot of choices. You can pick a system that fits in with your current HVAC system, a stand-alone system, or one that mounts between a furnace and return air duct. You can pick an air purifier that works in one room or one that covers the entire house. An Argent technician walks you through all the options available to you – and which ones work best for your family’s needs and your particular home. Air cleaners are beneficial for everyone in the home, as pollution is a top concern for environmentalists everywhere. They are particularly useful for members of your family with allergies, asthma, breathing problems, and other serious medical conditions. Hospitals use top of the line air filtration systems to keep patients healthy – your home can be just as pure with the help of Argent. Is your home too dry? Is it causing you illness and discomfort? When your air is too dry, it can lead to colds, sore throats, flu, dry, cracked skin, and more ailments. Having the right amount of moisture in your home is crucial. A humidifying system helps ensure your home has just the right amount of moisture so you can remain comfortable year-round – even in the cold, dry winter. Whole house humidifiers are installed directly into your home’s heating and cooling system to deliver appropriate moisture without any effort on your part. Argent also offers steam humidifier installation, which is an eco-friendly, energy-efficient way to balance your home. Let one of our technicians decide on the best option for you. Installation is quick and easy. If your home is suffering from excess moisture, a dehumidifier is the way to go. Too much dampness and moisture can cause mold, property damage, and mildew. Basements and garages are particularly vulnerable to too much humidity. You can choose from a whole house dehumidifier that works with your current HVAC system or a stand-alone system for a single room. Let an Argent representative help you decide on the best option for you. The potential mold and bacteria growth on your air conditioning coils is a result of normal condensation that takes place during the cooling process. A UV Germicidal Lamp is designed to kill that mold and bacteria. The addition of a UV Lamp to your home comfort system can reduce your family’s risk of allergic reactions and illnesses as well as eliminate the foul odors associated with such growth on the coil. To learn more about how Argent can help with your UV germicidal installation, contact us today. For help installing or repairing an air purification or filtration system, call Argent today at 908-286-1920 to speak with a representative who focuses on residential services. Our main office hours are 7AM to 5PM, Monday-Friday, but we are available for emergencies 24/7 at 800-807-2103. 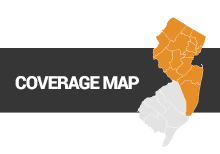 Our technicians service clients in and around Morris, Essex, Union, and Somerset Counties, New Jersey.